Hillary Clinton's presidential campaign and its allied organizations failed to use information that would have brought down Donald Trump, according to leading pro-Clinton operative David Brock. The Clinton campaign passed on opposition research from Brock's Super PAC American Bridge designed to paint Trump as "not just a sexual predator, but also an economic predator," Brock will claim at a Florida retreat for Democratic donors and operatives on Friday. "Top strategists…chose not to push" that message, Brock will say, according to a copy of his prepared remarks obtained by the Washington Free Beacon. "The Priorities [USA Action] Super PAC followed the campaign's lead." According to Brock, the campaign and its allied groups were convinced "that Trump was already too well-branded as a successful businessman." But he says their decision not to run with American Bridge's research might've cost Clinton the election. "Did Hillary's own campaign rob her of the only anti-Trump argument that would have opened up the all-important economic issue to her advantage? That's the inescapable conclusion." Brock's remarks will come during an opening session of the inaugural gathering of what he is calling Democracy Matters 17, where deep-pocketed Democratic donors have gathered at the ritzy Turnberry Isle Resort in Aventura to discuss what went wrong in 2016 and how to resist the Trump presidency. Brock's speech, scheduled to run 15 minutes, angrily denounces Trump and the people and forces that propelled him to the White House. "We'll remember [FBI director] Jim Comey and the Clinton-hating traitors inside the FBI" who "stole the election," he will say. His speech also singles out "the Russians," efforts to limit public employee union power in the Midwest, and "the purveyors of fake news." The speech then describes the efforts of each of the four major arms of Brock's network of political groups: American Bridge, media-focused oppo site Media Matters, legal advocacy group Citizens for Responsibility and Ethics in Washington, and political blog ShareBlue. 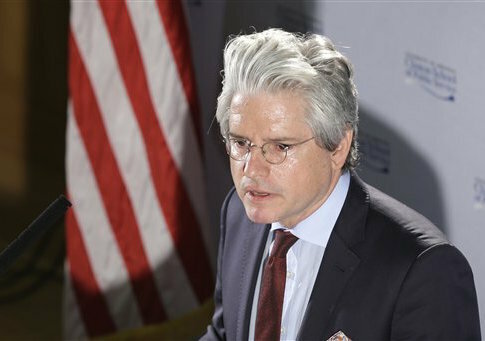 "I believe we Democrats are suffering from a crisis of competence," Brock will say. "Progressive politics in America is an organizational disaster." He hopes to solicit money from donors to ramp up his own network of left-wing institutions, which, he revealed in his speech, raised $75 million during the 2016 cycle. Brock is also slated to announce some leadership changes. ShareBlue, which he has previously described as a potential "Breitbart of the left" (he will walk back that comment in his speech, saying it is "an answer to Breitbart on the left") will be led by left-wing journalist David Sirota, currently an editor at the International Business Times. Brock's speech ends with an uplifting quote from Samuel Adams and a plea for money. "We need you to support this work, not just financially but with your deeds, your spirit, and, importantly, your ideas." Free Beacon reporter Joe Schoffstall contributed to this report. This entry was posted in Politics and tagged David Brock. Bookmark the permalink.